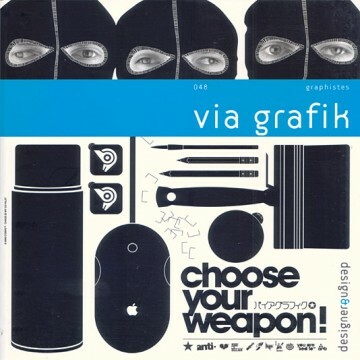 Design & Designer 048 – Via Grafik, official blurb: The members of Via Grafik created their collective in 1998 and chose their name as a slogan. Construction, deconstruction and provocation are recurring themes in their work. There is a very strong interaction between their graphics and graffiti – two disciplines that nourish and enrich each other. The collective fuse artistic techniques and practices, faithful to their motto, "From wall to screen to everything". Clients include Nike, Volkswagen and Nintendo. One of their installations was recently exhibited in the courtyard of the Klingspor Museum for Modern International Book Art, Typography and Calligraphy in Offenbach, Germany.